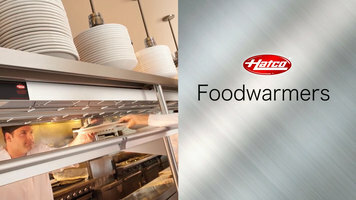 Hatco's overhead foodwarmers are uniquely constructed to optimize food holding. Keep foods at peak serving temperatures without overcooking. Compare the quality, flexibility, and dependability and you'll see why more food service professionals choose the leading foodwarmer brand--Hatco. Designed for both front and back-of-house, they are used by all segments of the food service industry from restaurants, fast food chains, and convenience stores to hotels, hospitals, schools, and more! They can be installed in chef counters, server pick-up stations, or buffet areas with two major goals: to keep food hot and to keep food safe. Depending on your Hatco foodwarmer selection, voltages can range from 120, 208, 220, or 240. There are single versions, or when more depth is required, duals are available. For front-of-house applications where illumination is desired, Hatco foodwarmers are available with a light channel. 60 watt, shatter-resistant, incandescent lights enhance product display while safeguarding food products from bulb breakage. The light option is available on both single and dual foodwarmers. An ecological and money-saving lighting solution is the Chef LED bulb, available for all lighted foodwarmers. It uses 92% less energy, illuminates instantly, is dimmable, and can be rotated to showcase your food products below. Most Hatco foodwarmers come standard with an on-off toggle switch, but can be ordered with an infinite switch which allows heat-level adjustment. Hatco recommends remote-mounted controls. This keeps controls away from the heat, which prolongs their life. Remote control enclosures are available with various switch options. Glo-Ray infrared foodwarmers feature an infrared, metal-sheathed, L-rod element that provides an energy-efficient, pre-focused heat pattern, ensuring uniform heat distribution and temperatures. Illuminized, radiating reflectors direct heat to the outer edges of the holding area where heat loss is greatest. This minimizes moisture and heat loss, plus optimizes holding time. Hot foods stay fresh and tasty at peak serving temperatures while promoting food safety. The metal-sheathed, L-rod element is warrantied against burn-out and breakage for 2 years. A reinforced, wire guard protects and holds the element in place without affecting heat distribution. Heavy-duty insulation minimizes heat loss. 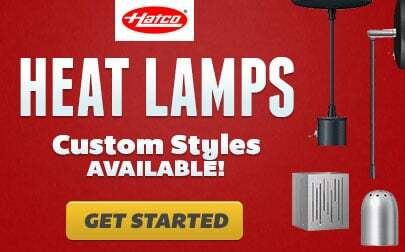 Hatco's Glo-Rays are available in sturdy, extruded aluminum housings that do not sag. It widths from 18" to 12', and in stainless steel housings up to 8'. They can be installed quickly and easily using a variety of mounting arrangements to suit various foodwarmer applications including chain suspension, C-legs and T-legs for portable applications, tubular stands, and adjustable angle brackets for under-shelf mounting. If installing under a shelf, be sure to have a 1" space or air gap between the top of the heat strip and bottom of the shelf to minimize heat buildup and prolong the life of the controls. Hatco's attractive Designer series Glo-Rays are available in a variety of models, configurations, colors, and accessories to provide unlimited flexibility. This modern design is ideal for front-of-house use with the same reliable, cal-rod heating element. 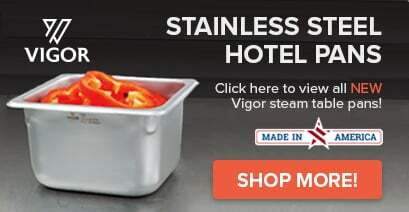 The slim, attractive, curved, narrow foodwarmer, which is only 4" deep and 2" high, is an ideal top heat source in tight spaces and front-of-house applications. Ceramic emitters have a stronger, more intense heat source and can be installed at higher clearances. They are ideal for holding fried foods. Infra-Black emitters are perfect for products that need gentler, overhead heat like eggs, soups, sauces, gravies, and wherever there is limited clearance. Infra-Black elements provide a very even and thermostatically-controlled heat source. They are also available with infinite controls. A wide range of extras make Hatco foodwarmers ideal for front-of-house locations. Protect food products with the sneeze guard option. Various color finishes are available to complement the decor of any restaurant. Slant reflectors, available at no charge, focus the heat front or back, putting the heat where it's needed and improving service from kitchen to customer. Performance, durability, dependability. Hatco--people who serve, products that solve. Hatco food warmers are available in a range of styles and sizes. Learn how using food warmers can protect food and keep items at peak serving temperatures! Keep all your signature menu items hot and tasting fresh out of the oven with this Hatco GRAH-24 24" Glo-Ray infrared strip warmer! The pre-focused heat pattern on this 500W high wattage strip warmer directs heat from a metal-sheathed element to bathe the entire holding surface, maintaining serving temperature for a longer period of time without continuing to cook the food. A solid aluminum housing eliminates the risk of "sagging" in the middle, and a toggle on/off control makes operation simple.